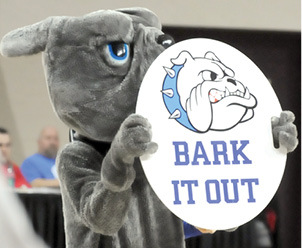 Clinton County News	» Bulldog up . . .
Bulldog up . . . The Clinton County High School Dawg (James Cecil) took the floor Thursday night in Richmond during the player introductions, doing his part to get the crowd fired up for the Bulldogs first round action game against Shelby Valley in the All “A” Classic State Tournament. Despite mounting a comeback run to take the game into overtime, the Bulldogs lost the game to the Wildcats, 66-63. See page 7 and 8 for game photos and a summary.